The spam is grilled until crispy, perfectly caramelized with soy sauce and sugar, and wrapped with sushi rice. 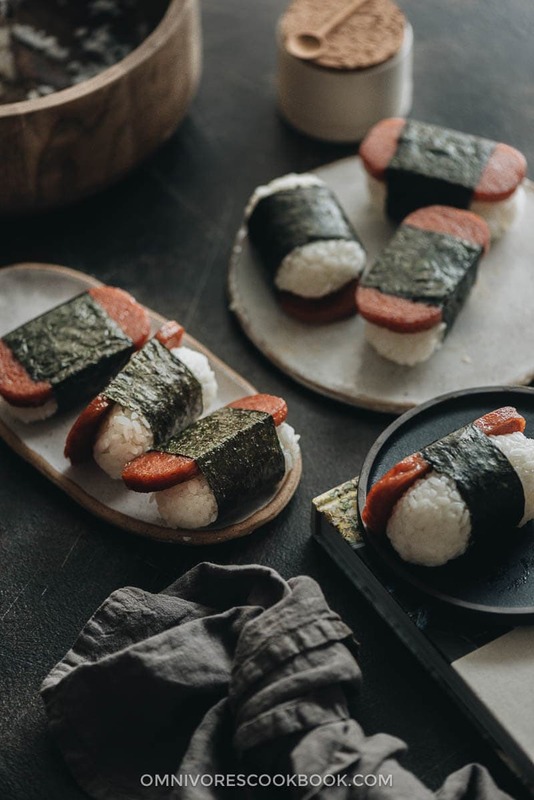 Made ahead of time, these Spam musubi are perfect for your lunchbox, appetizer platter, or potluck. They are also a fantastic game-day snack. This recipe uses just the right amount of seasoning to create a balanced flavor that’s addictively tasty. The name Spam might make you think of high-sodium military rations. But in China, it’s a popular ingredient that people use in comfort food. Spam and pepper stir fry, Spam omelette, Spam grilled skewers, Spam fried rice, or Spam sandwich. You name it. Spam is also a popular ingredient in Chinese Hot Pot and Sichuan Mala Pot – a popular type of Chinese restaurant where you choose a spicy sauce and various ingredients that are cooked in it and then everything is served in a big pot. Every time I go to Mala Pot restaurants with friends, I remember to order a few slices of Spam and it’s always the most popular ingredient in the pot. Spam is so intertwined with Chinese food culture that I’d never considered Spam a foreign food until I moved the US. Then I started to wonder when it came to China. Apparently, Hormel also decided to name it “luncheon meat” (午餐肉) instead of Spam, to make it sound glamorous. No wonder. Back in old days, Spam was considered a fancy thing that people would serve for dinner on Chinese New Year. 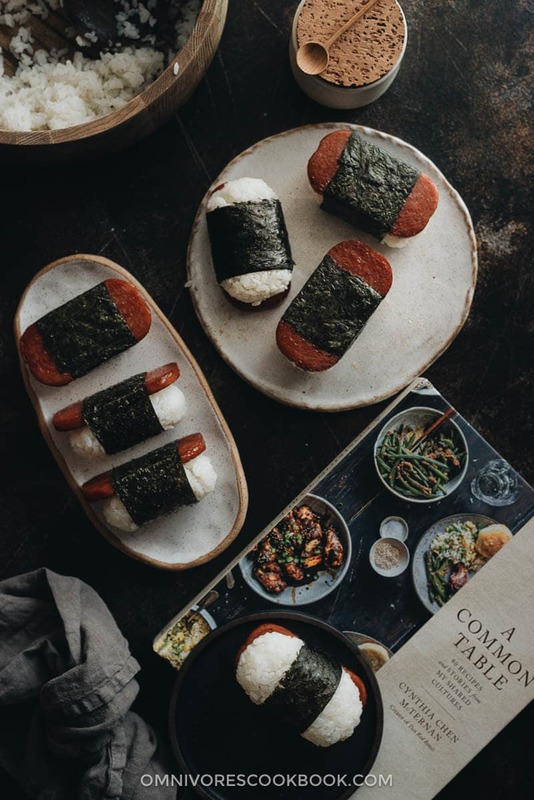 This spam musubi recipe is quoted from the cookbook A Common Table – 80 Recipes and Stories from My Shared Culture, written by my friend Cynthia Chen McTernan, who is the author behind the award-winning blog Two Red Bowls. 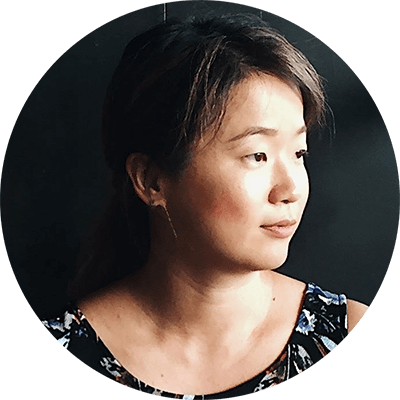 With a Southern Chinese upbringing, having grown up in the US, and married to a Korean husband, Cynthia shares 80 modern Asian-inspired recipes that are creative, practical to make, and extremely delicious. The book makes my mouth water every time I flip through it. I truly resonate with her cookbook. With recipes such as Kimchi Brined Spicy Chicken Biscuits, Bulgogi Burgers, Egg Custard Steamed Buns, and Black Sesame Twists, it reminds me of how I cook in my American family. A melting pot of traditional Chinese, with elements borrowed from various Asian cuisines, and comforting American food. I wanted to share a recipe from her book and introduce it to you a while ago, but it took me a long time to nail down the recipe. The reason? I’d bookmarked more than 20 recipes I wanted to make, but it was nearly impossible to pick just one. 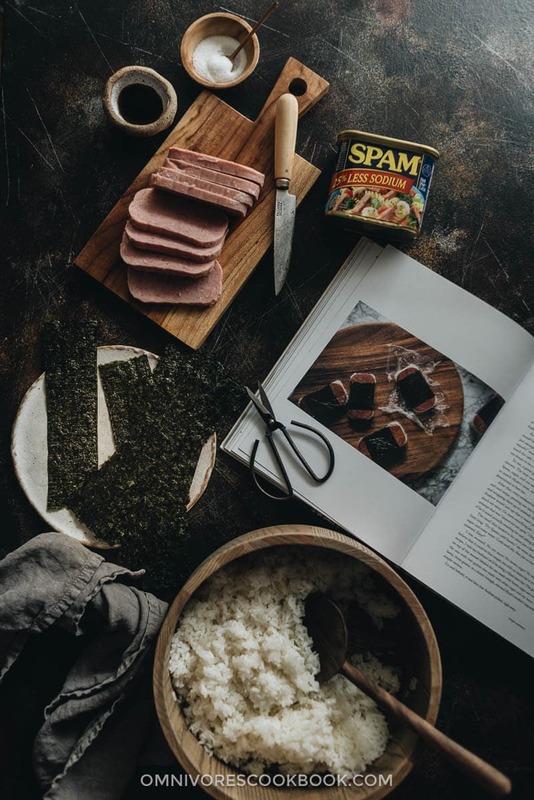 Eventually I decided to share her Spam Musubi recipe – a great representation of how Asian food inspired local cuisine and became a part of its culture. Even though I got to know this Hawaiian dish only after moving to the US, it makes me feel nostalgic because of the use of Spam, an ingredient that reminds me of time spent with family and friends. Cynthia did such a great job documenting the cooking process, that it was extremely easy for me to follow. Even though I’d never made spam musubi in the past. I’ve changed the wording of the recipe slightly, based on my own cooking experience and recipe style. For example, I added the metric measurements to make cooking easier for my international readers. And I didn’t include the saucier version in the footnotes, because I think the original version is perfect. The original Hawaiian spam musubi does not use sushi rice, which has added rice vinegar and sugar. But I decided to experiment with it. I ended up liking the result so much more than the original version. The refreshing acidic note cuts the greasiness of the Spam, mellows its saltiness, and works perfectly with the sweet taste. If you’re feeling adventurous, use the sushi rice recipe from Just One Cookbook. The extra time is definitely worth it. It’s very important that you brown the spam slowly and thoroughly. It renders some fat and makes a very crispy crust. Then you will use some sugar and soy sauce mixed with water to quickly braise the Spam. You will end up with a beautifully caramelized dark brown surface that is still chewy and sticky. It’s perfect. In Cynthia’s cookbook, she includes an assembly method using a musubi mold. It makes the process much easier and less messy. Since I don’t own a musubi mold, I only included the traditional way in the recipe, where you use your hands to press the rice. Below are the step-by-step pictures showing how to assemble the musubi. When you press the rice by hand, it’s important to use proper strength so that that the rice is pressed together but not overly mashed. If you don’t press enough, the musubi might fall apart when you bite into it. If you press too hard, the rice texture will be too dense. It takes a bit of practice but once you make a few musubi, you’ll get the idea. Chinese New Year is right around the corner. So I’m hosting a giveaway to celebrate the festival. This week I’m giving away 5 copies of A Common Table – 80 Recipes and Stories from My Shared Culture to 5 lucky winners (sponsored by yours truly). Not only does the cookbook contain great recipes, it is also so beautiful that it makes a perfect coffee table book gift. This giveaway will be open from Jan 20th 2019 and will close on Jan 27th at 11:59 pm CST. This giveaway is open to everyone. Please note, if you do not reside in the US, you will receive a $25 Amazon gift card. Four winners will be selected via Pick Giveaway Winner and contacted via email so please include a valid email address in the email address entry box (Your email address won’t appear on the website). Leave a comment below this blog post, sharing some of your favorite Chinese and Asian dishes. Start making steamed rice (or sushi rice) if you don’t have any on hand. Heat a 12-inch (30cm) nonstick or well-seasoned cast-iron skillet over medium heat. Add the Spam slices and cook until browned and crisp on the bottom side, 2 to 3 minutes. Flip and cook until the other side is also browned and crisp, 2 to 3 minutes. Whisk together the water and soy sauce in a small bowl. Sprinkle the sugar evenly over the Spam slices, then add the soy sauce mixture. Swirl to evenly distribute, then let the Spam simmer until the liquid is nearly absorbed, 3 to 4 minutes. Flip once in between, so the sugar will melt completely and camalize well. Transfer the Spam slices to a plate to cool. To make the sushi: Place one slice of Spam perpendicular to the nori strip on the bottom of the strip (forming a cross shape). Wet the palms and fingers of both hands, measure 1/2 cup of rice, and transfer the rice to your palm. Use both hands to firmly press the rice into a ball. 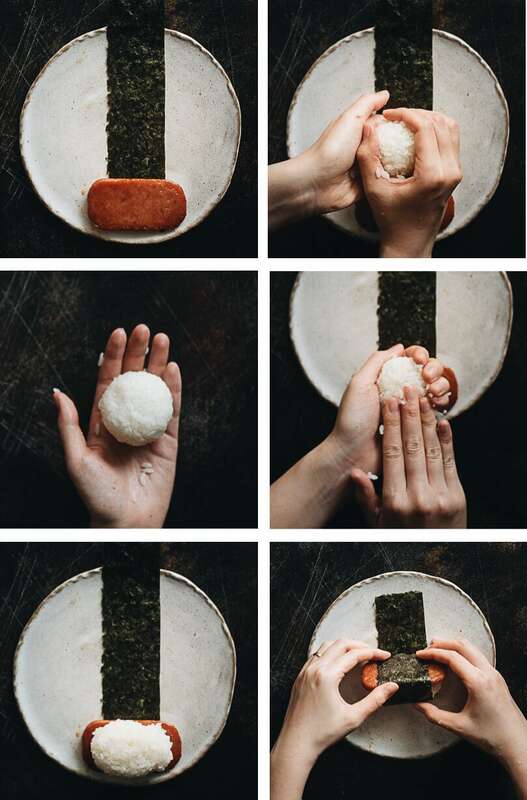 Then hold the rice ball with your left hand, with your thumb and the other four fingers to secure both sides, use your right hand to gently press the rice ball into a rectangular shape about the size of the Spam slice. Place the rice on top of the Spam. Roll up the Spam and rice to let the nori sheet wrap around it. Seal the end with a bit of water and place the musubi seam-side-down while you work on the rest. Repeat with the remaining nori strips, Spam slices, and rice. Remember to rinse your hands every time, to minimize rice sticking to your hands. Enjoy the spam musubi immediately at room temperature. You can store them in an airtight container or wrap them with plastic wrap and place them in the fridge. To serve refrigerated musubi, warm them in the microwave for 20 seconds or so, to get the best texture. 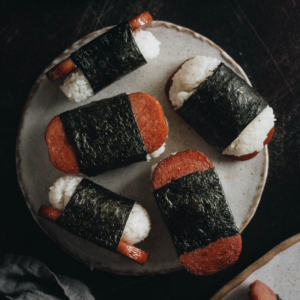 The original recipe uses regular steamed rice, and so do most Hawaiian Spam musubi recipes. However, I personally prefer making sushi rice, which contains rice vinegar and sugar. The acid and mild sweetness of the sushi rice complement the salty Spam and create more depth of flavor. The original recipe calls for 3 to 4 cups of rice, depending on how much rice you use per musubi. I found my personal favorite ratio is: slice the Spam into 8 slices, and use 1/2 cup of rice per musubi. In my case, I used 4 cups cooked sushi rice, which was generated from 2 rice-cooker cups (180ml per cup) of raw short grain rice. i was fortunate enough to live in Hong Kong for year and travel to China multiple times eposing me to so many home cooked meals of noodles and baos that are impossible to come by at restaurants..i also have a new found love for the use of lard in cooking and pastries since then! My mom’s egg rolls are always a hit, and pretty much anything my husband makes; all good Chinese food. My favorite Chinese dish is the humble tomato and egg stir fry. Tastes like home and full of comfort. My favorite dish is spicy Sichuan wontons! I have made many of your delicious recipes. They are a non-daunting approach to authentic Chinese cooking. Love making crispy pork belly. If you don’t have a musubi mold, you can always remove both ends of the spam can and use that. Makes it just the right size and quite easy! Hope I win one of the cookbooks! I love your site and have cooked, with success, many of your fantastic recipes! My go-to Chinese recipe is one I have tried to replicate from a small, hole-in-the wall restaurant I frequented while in Beijing. The restaurant was very near the Xindadu Hotel, which is near the Beijing Zoo. The menu consited of mostly Chinglish, but with pictures, traditional Chinese characters and prices in Yuan. I chose one that was labeled Mongolian (spelled Mongolean) and was a beef or mutton stir fry consisting of sesame oil. sesame seeds, pea pods, florettes of broccoli, Chinese cabbage, and something that looked like soba noodles. The dish was so delicious that I ordered it every time, even though there were other interesting ‘pictures’ on the menu. It’s been trial and error for me, but I think I have it down. Someimes I toss in some different veggies, but mostly I stick to the ones above. It is absolutely delicious and especially so when we have good mutton on sale here in NYC! Keep up the good work Maggie! Looking forward to trying spam musabi. I’ve heard of Spam but never tried it. I like anything with noodles – like your simple garlic noodles. This makes me want to try Spam. Easy recipe. Good directions. I love Miso Ramen soup. I use Miso Dashi and home-made chicken broth. Also Pad Thai, Mongolian Beef and trying to make pot stickers. They taste good, but look sort of floppy. I would love to win! I really want to learn some different type of cooking besides kid friendly. All the kids are moved out. I definitely want to try this. Miso Ramen soup, really any noodle soup. Pot stickers! I love the Crispy Chinese Honey Chicken because as the name implies it stays crispy and the sauce is scrumptious. Plus for an 80 year old who is new to Chinese cooking it is relatively easy to get a lovely meal prepared. My family loves hot pot. Silkie chicken for the stock base and my kids are happy! I love Musubi!! My other favorite Asian dishes are Salt and Pepper Shrimp, a won ton with chicken, traditional hot and sour soup, Singapore rice noodles, Szechuan eggplant….anything I can add Chili oil too!! Hmm hard to pick favorites… but my grandmother’s Taiwanese-style beef noodle soup or zha jiang mian are definitely up there! I lived in China for 4.5 years and went to Japan twice. Consequently, I was able to enjoy authentic Chinese and Japanese cooking and it is hard to pick only one as my favorite. Some of my favorites are Lanzhou Beef Noodles, chicken feet (with Harbin beer), pickled pig’s ear, and blood soup (from Hangzhou). In Japan, I really liked puffer fish, miso soup, and tempura vegetables! Oh, now I am super hungry!!! LOL!! Many of my favorite Chinese and some Asian recipes have come from your blogs, Maggie. I have been an avid follower over the last year plus since I found your blog. I do have a problem in that I am on a salt restricted diet and admit that I cheat when it comes to fish sauce and hosin, but I can minimize the sodium slightly by using diluted liquid aminos in the place of soy sauce without any loss in the recipes. When I was told I had to minimize by salt uptake, the decrease I had to make in limiting my Chinese and Asian cooking to once a week made me cry, but I stIll make many stir fried meals limiting their salt. That style of cooking that you helped me perfect, leaves my veggies so tender crisp and delicious and the quickly cooked (usually meat) protein cut into small pieces remains tender and full of meat juices! Thanks for the good training you have shown me. Looking forward to Japanese grilling as soon as the weather improves. Just found a good local source for yuzu kosho. Remember, there’s also reduced-fat SPAM. Anything dumpling… HK style pan fried noodles, my husband loves steamed whole fish and eggs w/tomatoes. And since it’s open to all Asian… LUMPIA! 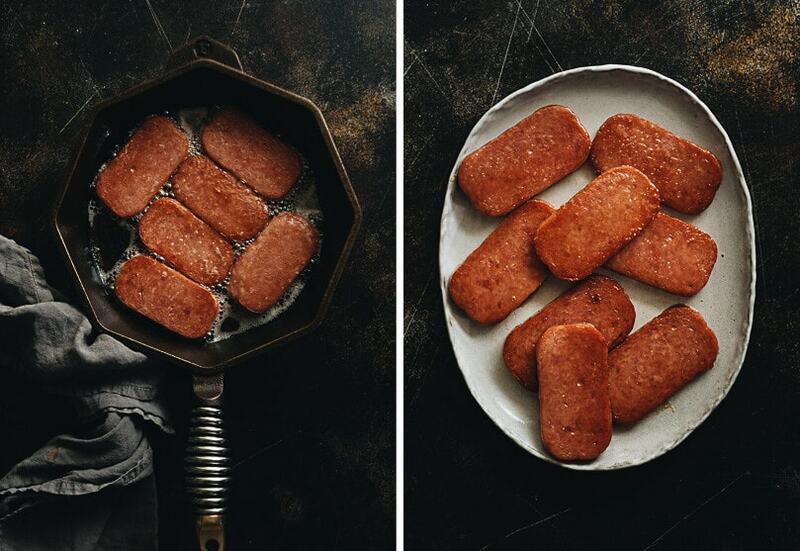 Spam brings back memories of all the great dishes my late grandmother could make from it! Omelettes, fritters, stews, you name it she’s done it! I think my all time favourite Chinese dish to eat is dumplings with spicy chilli oil & black vinegar. To be honest, I love food so much, it’s pretty impossible to just name my all time fav! Asian/Chinese foods all the way! I love Sichuan Boiled Fish (nice and spicy! ), salt/pepper tofu, poached whole chicken with ginger dipping sauce and any kind of stir fried greens for favorite Chinese/Asian foods. I love simple foods like steamed eggs, chow mein and fried rice. I just like food! There’s a restaurant in Garden Grove, CA, King Harbor Seafood, that serves Lobster With Yee Mein Noodles. It is soooo delicous! It’s always a treat to have this dish whenever we’re in the area. Thanks for the opportunity to win a cookbook! One of my favs is …..Mapo tofu! 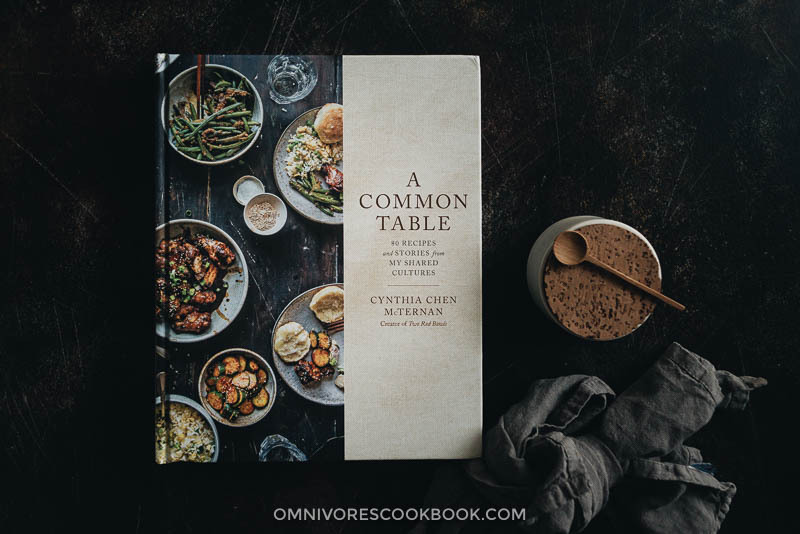 I love Omnivores cookbook and my heart is filled with joy each time I see a new one in my inbox. Believe it or not, my favorite asian dish is simply tea eggs. They are so delightful and a wonderful addition to any meal, any day. I also love simple vegetable dishes such as garlic broccoli or carrot salad. Of course, I have to give a shout out to the Wonderful spice combinations to various meats. This is so wonderful-total comfort food. Won’t mention my age 😉 , but Dad in army, stationed in Hawaii & learned about Spam and Chinese cooking. He’s Polish/Swedish …:-) Talk about blending cultures. Brought home to Colorado and my Russian mom… was new found food happiness. Been loving spam for generations. This was all during 1950’s when he was in army. Now my hubby and I enjoy at home in Nevada . Egg Works restaurant here serves Loco Moco with Spam…. outstanding., which we also make at home. Thank you so much for sharing this new and delightful recipe. The soy sauce and sugar with fried spam is simply genius. Musubi will most definitely be on our Chinese New Year menu… talk about good Feng Shui. Think I might add some Bok Choy sautéed or Kimchi. My all time favourite chinese dish is based around holidays as it is the only time everyone in my family gathers to eat my grandma’s home cooked meal. These include childhood favorites like “ketchup” pasta, lo bak gao, soy sauce fried noodles, chinese style curries, noodle soups and her famous nian gao! I love making pot stickers, barbeque pork and roast pork. While some may find making pot stickers from scratch time consuming, I find it very relaxing. And making my own bbq pork and roast pork means I always have them available when I want, instead of needing to head to Chinatown to make a purchase. My grandmother’s tomato beef chow yuk is my family’s fav. We also love cha siu bao, spicy wontons, soy sauce noodles, and tomatoes & eggs. Thanks so much for this giveaway opportunity! My favorite Chinese recipes are stews, both wet and dry, that aren’t served in most U.S. restaurants. Maggie, I so love your blog. Can you give us a recipe for a dish I had in Shondong Province. It’s like donuts with a wonderful dipping sauce. And there was another one made with pumpkin that comes with a sticky sauce on it. You dip it in water before eating it to stop the sugar strings. If you don’t eat it fast it sticks together in one big clump. And another one I can’t seem to make is an eggplant dish that looks like French fries and has a slight spicy aNd sweet taste to it. These are some of my favorites. Of course Jiao Zhi is my favorite. This recipe looks interesting and I’m curious about the book! My favourite will always be Ma Po tofu. I traveled many times to Asia and one of the things I enjoy the most is the cooking and foreign tastes. Sometimes, it is challenging to my North American palate but most of the time, I truly enjoy discovering the cuisine and new ingredients. I almost fell over when I saw that Maggie included a Musubi recipe in her last posting. My husband and I just came back from a 3 week cycling trip to Big Island Hawaii. All the grocery stores we stop in sold these amazing Musubi snacks to purchase on the go. Oh my god, that’s the replacement for gluten filled bread sandwiches! I bought Musubi cookbooks and musubi molds for Xmas presents for my relatives who have to make lunches for kids everyday. Maggie Zhus Omnivore Cookbook and website was a phenomenal resource discovery for Chinese Canadians like me, who were born in Canada but fully know the great foods made by parents, grandparents, and aunties, who are sadly all gone. If I win a cookbook, I will enjoy it and share it with others who have the same love of cooking. Thank you for the constant inspiration, Maggie. Loved hearing the history of Spam in Chinese culture. My favourite Asian dishes are Pad Thai, Pad see Ew, Okonomiyaki, satay, coconut rice and San choy bau. Delicious! Interesting information about Spam. It has a very mixed reputation here. I think my favorite thing about Chinese food is the vegetables and the way they are cooked quickly to a genuine crisp tender and then seasoned perfectly. I lived in Dhanghai for 4 months and enjoyed so much great food. But my two ultimate meals are spicy red chilly noodles with handmade wide noodles and any street food. I ate a ton of bao especially the Egg Custard Steamed Buns. When I traveled to kashgar I had grilled lamb, rice pilaf and nan for the first time and fell utterly in love. I miss being there so much and your website keeps me as close as I can be for now. I love your blog and now need to start reading your husband’s blog. Spam musubi is a favorite, but my all-time favorite Chinese dishes are soy sauce chicken and beef chow foon, both with a side of gai lan. Thanks for the giveaway. My fav Chinese dish is beef stew with beef tendons! Love your website and all your recipes. Wondering if there are any good Keto-friendly Chinese recipes out there. It would be awesome to see some on here! These look great! I love making homemade pork dumplings and vegetable spring rolls! Dumplings are my favorite, but I am always on the look out for something to challenge it! I love Sichuan food! Really brings back childhood memories, especially mala pot and spicy popcorn chicken. These looks great! I love homemade dumplings and spring rolls! One of my favourites is banh xeo! I went to college in Hawaii and SPAM musubi was definitely the best late night study snack ever! Love it! My favorite Asian recipe is Singapore Chicken Rice, simple but succulent. Favorite dishes would be Peking duck, char siu chow fun and any wonton soup! I love pho, chow fun, egg rolls, dumplings, won ton noodle soup, and caramelized braised pork and eggs. Love Asian food so much!!! Love this! Your writing and pictures are beautiful as always. My favorite Asian dish is mỳ quãng. It’s a noodle dish that native to my hometown in central Vietnam. I’ve seen it being replicated in a lot of restaurants but none surpassed the one made by my grandma. Thank you for hosting this giveaway! I love seeing your recipes!!!! My favorite dishes to make are the ones with noodles involved especially Singapore Noodles!!!! I love making anything with noodles!!! I love to keep it simple and how your Asian dishes on your blog are fun and easy to follow. Thank you! I love bok Choy and beef. I looove Dan Dan noodles! But really I haven’t tried a Chinese dish I haven’t liked! I love dumplings. The ‘boring’ boiled Northern Chinese ones. My taught me how to make them and basically every female member of my family. I loved it when everyone gathered together and made dumplings and the room was filled with laughter, chatter and smells. Back when we were living in Beijing, Mum made yummy fried rice with SPAM, I loved it. So I was really curious to try out your recipe and was amazed how simple it is to make and how good it tastes. I love it! Thank you for bringing childhood memories back! One of my favorite Chinese dishes is mei cai kou rou (pork belly with preserved vegetables). Favorite dish is my father’s chow mei fun with spam, eggs, fried fish balls, and bbq roast pork. Add some sriracha on top. My favorite recipe of recent is your cumin lamb one. It was just so delicious that I need to make it again asap! Otherwise. I also love the steamed sticky rice dish with chinese sausage, and a simple go-to, the classic egg and tomato dish that every Chinese family makes, never goes wrong. Fave dishes are xiao long bao and Peking duck! This sounds really good – I’m going to have to try this. It seems like it would pair nicely with two of my favorite dishes: extra hot szechuan beef stew and “stinky tofu” (chòu dòu fu). Thank you for sharing this recipe! My husband is Hong Kong Chinese. Your blog has been hugely helpful! I’ve been reading your blog and following you for a while now and absolutely love your food aesthetic! One of my most favorite Chinese/Asian food is definitely spicy Mapo Tofu; there is such a satisfying balance between textures, flavors and spice level. The silkiness and delicacy of the tofu works so well with the ground meat and spicy sauce, it almost cools your mouth instantly but have you wanting for more. I also definitely love pan-fried dumplings. Nothing can ever beat that; especially with the endless filling options available so anybody can eat it and the juiciness you get that contrasts with the crispy skin! Any Asian food involving Spam is the best! My favorite dish is steamed egg by my grandma and oxtail stew by my mom! I love spam musubi! I prefer it with sushi rice and I usually make it in the molds. But when you have too … it’s equally tasty deconstructed in a bowl with little spam squares, sushi rice, and seaweed sheets, topped with a few green onion bits. My favorite Chinese dish is the salted fish and chicken (or shrimp) fried rice! So good and reminds me of home. My favorite Chinese dish is the salted fish and chicken and (or shrimp) fried rice! Everytime I have it, it reminds me home. No tengo plato favorito, espero aprender un poco si me gano. Libro! 🙂 Gracias y saludos desde Argentina! I love Peking duck, and when I have the opportunity I try to taste any duck dish. But, looking at the spam photos, that brought back memories of having spam as a child for our supper meal. Time to go buy a can of spam and try out this recipe!!! thank you so very much for bringing back nostalgic memories and smiles! Gotta love Taiwanese beef noodle soup and HK curry fish balls (and milk tea of course)! I really need to get my hands on this book. I’ve been DYING to try new recipes outside of my comfort zone. My favorite Chinese food is actually a recipe from this site I’ve made: Chicken Chow Fun. I live for dumplings, hot and sour soup, good spicy shocker, dolt solt be bum bap! Very simple but my favorite dish will always be either tomato egg or bitter melon and egg. Nothing reminds me of home and my mom more than making those two dishes; such a comforting balance of flavor and texture over rice that feels like a hug. Growing up in Malaysia, I have the privilege to be surrounded by all kinds of food every day. A country of a melting pot of culture, it’s very difficult to pin point one favourite Asian Chinese food, but I’ll have to say one of my all-time love belongs to Chinese herbal tea eggs, otherwise known as 茶叶蛋 here. It reminds me of the times I spent in shopping malls with my dad. I always get cold easily and my dad would buy 3 eggs from one of stores that specialises in Chinese herbs for me and my 2 siblings. Holding it in my hands, the warmth I felt did not only come from the eggs, but also my father’s love. It truly brings back fond memories eating it now. But I’ll have to admit, the best herbal tea egg I’ve ever had was in Taiwan when my family went for a trip there last year. My dad even tried making it at home ourselves, and found that using quail eggs with the same herbal tea formula yields the best result. All in all, you bet I was extremely happy to see the recipe on your blog! Your blog brings people and food together, so thank you, and 祝你新年快了！Much love, Ejin – Malaysia. My favorite dish is definitely minced pork over rice! I LOVE it as a breakfast item and would eat it for every meal if I could. We love wontons, dumplings and tonight I made your Crispy Chinese Honey Chicken (without Deep Frying) and the kids devoured it!! I just discovered your website, and have made 2-3 recipes, all of which have turned out yummy! I’m a 4th generation Chinese-American, and grew up eating authentic Chinese cuisine. Your recipes expand my cooking repertoire, and providing the Chinese characters and names in your recipes have been VERY helpful in obtaining the ingredients I’m unfamiliar with in Asian markets. My mother always told me how expansive Chinese cooking was. She was right! Thank you for taking the time to write down and experiment with these dishes so that we can all enjoy them! These look so good! I randomly crave spam musubi and would love to make them at home. Hard to pinpoint a favorite Asian dish, but I often crave my dad’s taro (plus fridge leftovers) fried rice. This amazing and your combination of 2 of my favorite foods ( Spam,Sushi Rice ) cannot wait to try this. Not sure if my comment posted earlier, so trying again: these spam musubi look so good! Would love to try making these at home. It’s hard to pinpoint a favorite Asian dish, but I’m always down for a big bowl of noodles (beef noodle soup!) or some seoullangtang! I’m a HUGE fan of chinese trotters! The red cooked variety is my favorite! Chicken feet and steamed ribs with black beans rate in my top 5 as well! NOM NOM NOM!!! My favorite Vietnamese dish is always a hot bowl of pho any day of the year. Oooooo spam!!!!!!! Love the idea of braising it in sugar and soy sauce!! I love making ( and eating!) scallion pancakes, 画卷 (scallion flower buns), 煎饼 （I still have yet to find a great home cooked recipe for that), and al the dumplings !!!!! I love all food Asian. If I had to pick only one type of food for the rest of my life it would be Asian. Some of my favorites are curry chicken, egg foo yung, salt and pepper shrimp, pepper steak, shrimp with lobster sauce. Now I’m hungry. So I found your web site looking for Szechwan Eggplant and I’m amazed by the Chinese Eggplant in garlic sauce and the Sichuan eggplant. I use your site all the time when I go to the Chinese groceries by my house. I would love your cookbook we recently moved and I have no more cookbooks. Your book would be a welcome addition to my home. Oh how I remember the days I thought luncheon meat was a pretty gourmet ingredient haha so good with rice! My favorite Chinese recipes are those that reminds me of the home cooked food I enjoyed as a child. Hard to pick a favorite but during the Lunar New Year, I particularly enjoy “luo han zai”. Love that red fermented bean curd sauce. I love your Lion’s Head Meatballs! Chinese and Vietnamese are my favorite foods followed by Japanese! The foods of these cultures are such clean tasting food and, since my sister-in-law is Vietnamese, I’ve been fortunate to have learned a lot from her. I eat dumplings almost every day for lunch and also enjoy making Chinese Spring Rolls that I keep stocked in the freezer. We recently got a new, really large Asian market and I’m thrilled about the fact I can now have access to more ingredients. My favorite Chinese dishes are always the every day home cooked meals; garlic scapes with shredded pork, stir fry celery and lily bulbs, beef and potato stew. Love them all!! Spam musubi is also amazing, I love coating spam in a beaten egg and frying it! My all time favourite Asian dish will be Ko lou Yoke, sweet and sour pork. I like mine with the meat remain crunchy and comes with a lot of pineapple abd tomato cubes. Simple to make a dish. With fried spam, susi rice and musabi, thank you! I absolutely love kung pao chicken! Another Asian dish I love is pad thai! Can you tell I love dishes with peanuts? So Many! I love trying new dishes from different cultures and I’ve made so many recipes that you have shared with us, and love them all. My absolute favorite Chinese dish, though, is a very simple and fast egg drop soup. Perfect when I’m tired and have little time – especially on cold winters nights! I made some tonight for myself and my husband after getting home late. YumYum! I can’t wait to try these Spam Musubi!!! I love all dumplings! I could probably eat dumplings and potstickers every day and never get tired of them! I also love beef lo mein and egg drop soup! Spam Musubi is a family favorite. Potstickers and Char Sui Baos are also favorites. But my mom’s radish cake, taro cake and New Year’s cake are what my kids love the most. Chinese comfort foods are the best! There’s a little Chinese restaurant inside our Ranch 99 that serves my favorite duck noodle soup for breakfast. The broth is so flavorful. I can’t find a recipe for it anywhere. Thanks for the musubi recipe. Need to try a copycat Foodland fried chicken musubi recipe. Absolutely love your recipes. Helped us make classic Chinese dishes such as mapo tofu and chicken rice noodle ( haw fun) ! Cashew Chicken is my favorite dish to order when going out for Chinese Cuisine. It has a medium brown sauce… celery, carrots, water chestnuts and cashews to mention a few ingredients. On the other hand my husband’s favorite is Vegetable Lo Mein. Our “dessert” of choice is Sesame Tofu. The Sesame Tofu we had was made with a dark, sweet brown sauce and had steamed broccoli around the edge of the dish. Delicious! Maggie, do you have recipes for any of these – Cashew Chicken, Vegetable Lo Mein or Sesame Tofu? Good Luck to those who enter. I am looking forward to receiving one if possible. I really love simple cooked snow pea leaves and kung pao tofu! There are so many good veggie Asian dishes. I haven’t had much (any, really) experience cooking Chinese food, but I really want to learn some good recipes! I make a lot of Thai and Japanese foods, with my top favorites being Onigiri snacks, Thom Ka soup, and Larb made with chicken. I would love to cook my way through this book! Spam musubi is one of my favorite dishes; It reminds me of Hawaii. I went to the ABC store every morning to grab some spam musubi for breakfast. Now I make them at home for my family 🙂 This recipe looks delicious! You, two red bowls, and spam musubi – no way a blog post gets better. I did spam musubi just the other night – my wife bought he a spam cutter (kind of like an egg slicer) so I simply *had* to do it – YUM. Their butter mochi is divine, if you haven’t tried it! My favorite Chinese dish is probably yushang qiezi, spicy garlic eggplant. One reason I like it is that it is pretty hard to screw up, even at an American Chinese restaurant where often the dishes aren’t as good. I also love a good Thai green curry, poke (not sure if that counts as Asian Food), and some other types of Chinese food such as Chao Bing, zui pi niu nai, and spicy pork cucumber noodles. And of course jiaozi! My favorite dishes are anything noodley and anything with dumplings. And spicy! My ultimate meal is a spicy ramen soup with dumplings and chicken skewers on the side. So good! This cookbook looks so fun- exactly the kind of thing I like to try. Anything dumplings or fried rice dishes are so comforting. My favorite Asian dish is either Shabu Shabu, or Mabo tofu. My favorite dishes are Szechuan green beans and hand shredded cabbage. The cabbage I fell in love with while teaching English in China last summer. Love love love GON CHOW NGAU HO ( stir fried beef rice noodles)! Always reminds me of growing up in LA and going to HK style cafes with my parents , or even better, when we visit family in Hong Kong. Thanks for sharing your blog and feed with us on insta,! Long time follower but first time commenter — love your recipes and your photos so much! I love Cha Shu and I have yet to find the perfect Cha Shu recipe. So for me fried rice with Cha Shu is the best for me. (oh, I did try yours and I am happy. But still looking for that perfect cha shu recipe). Also as for spam musubi, I like my rice plain so the spam with the teriyaki sauce can favor the whole rice. (I guess that’s how my husband’s cousin show me how to do that – she is from Hawaii). I love any food Asian! Be it dumplings or stews or one pot dishes. I love the rice based dishes the most though. My absolute favourite Asian dish is Fujianese noodles from my parents home town 🙂 The thick noodles paired with assorted seafood fresh from the sea tastes amazing and always brings me happy memories of my childhood. This is a dish a college roommate introduced me to and have thought about it ever since (over 15 years). I also really enjoy Japanese cheesecake and Malai kofta. LOVE your website and recipes! We just came back from living in China and all these recipes are really authentic to my experience. Thanks, Maggie, for keeping us up on so many great authentic recipes! I certainly know where to go to find those Chinese goodies I crave! My absolute favourite dish is Fujianese noodles from my parents home town 🙂 its thick noodles paired with fresh seafood straight from the sea tastes amazing and always brings me happy memories from my childhood! Have you tried it before? I’ve made many of your dishes but my favorite has to be the beef noodles that you make with hamburger & 2 beef saimin packets. It’s my favorite because this recipe I’ve made the most, its quick & easy to make, & all my 3 boys just love it!! They devour it in seconds lol! Thank you for all your great recipes, it has helped with ideas of quick meals & also helped me tap back in to how fun cooking can really be & trying new things! I just bought all the stuff to make musubis just last night & excited to try your recipe. I grew up in Hawaii so these were always around. I always get really excited when I see your posts & look forward to making your recipes. Thanks again Maggie! I love Asian food way too much to narrow it down to just a few favourite dishes. But because I have a trip to Hong Kong coming up, I’ll say one of my absolute favorite Asian dishes is the fried pork buns at Tim Ho Wan in Hong Kong. Oh my goodness they are what dreams are made of. This recipe looks delicious. I think spam is stupid tasty so I am definitely gonna try it sometime! A. couple of go to favorites are Mapo Tofu , Mongolian Beef and Singapore Noodles. I like making spring rolls. I’d like to make my own noodles someday. I’m definitely going to try spam musubi. Thanks for the contest! My fave for lunar new year is bing pi yue bing. It’s kinda complex for me but a good challenge. Goal for this coming year: make it more edible next year lol! I’m a US citizen living in Shenzhen at the moment. I love Dumplings (Jiǎo) of almost any style or flavor, Ma Po Tofu, Sichuan Hot Pot (I haven’t tried Chongqing hot pot yet), a millet ball I had in Harbin and many vegetable dishes – Here they eat pea leaves, and Chrysanthemum leaves. I also love the fruit teas but haven’t found a recipe to make my own. Oh wow what a delicious looking recipe! I don’t think I can pick a favourite Asian food. If I had to narrow it down, I think I’d say wonton soup, xiau long bao, and Szechuan green beans. I can’t wait to continue seeing more amazing recipes! I wish I could try all of your recipes!! If I could narrow my favourite Asian foods down I would have to choose wonton soup, xiau long bao, and Szechuan green beans! A lot of the meals we enjoy come from your website, we especially enjoy your stir fry procedure advise. Of course this is hands down easy. Eggrolls! My husband travels for work and is always gone for months up to at least a year. And he LOVES to cook. Because hes always away from home , he uses his cooking to meet and get to know people from all walks of life. And on one of his jobs he met an older lady(a grandmother, I forget from where) who gave/taught him this awesome egg roll recipe. The next time he went home he shared it with his mom(whose an unbelievable cook) and its been a family tradition ever since. His family, mom, grandma, sisters, cousins,neices and nephews, get together and they make an assembly line and everyone participates on chopping, cooking, rolling and frying. And years later he met me and I was included and accepted(and tested on my rolling skills lol) into the tradition. The recipe is awesome. We never make less than 250-300 because they are that good and its hard to stop eating them. But I think what really brings it home is the fact that they keep his family together. That bonding time is precious and something you can never replace. And with him being on the road a lot… he eats ever ounce of it up. No recipe matters if it you cant share it with those you love. I have sure enjoyed your news and have tried lots of your recipes. My family love the Chinese and Asian food. I would like a recipe for tomato beef chow mane. also enjoyed your demo how to use the chopsticks. Spam musubi is one of my favorite snacks, sometimes meal!! Sooo good!! I miss Hawaii everytime I eat it!! My favorite dish is Sichuan eggplant stir fry! Oh god, there are so many amazing Chinese recipes out there it’s like choosing your favourite parent! I know it’s simple, but I’m such a sucker for 雪菜肉絲米粉! Shredded with preserved salted cabbage and vermicelli noodle soup! My mum used to make this dish a lot for breakfast for me as a kid! It’s my ultimate comfort food! Hello! Some of my favorite Chinese recipes are of course pork fried rice, chow mein, egg rolls, pot stickers. Wor won ton soup!!! Pork fried rice, egg rolls and pot stickers are just a few of my favorites! Please enter me into the drawing? Thanks so much!!! If I had to pick just one, it’d probably be mapo tofu. I thouroughly enjoy your blog, thr ecipes and the stories. Great to get to the source. Char siew and siew yuk are definitely my fav! All my friends and family tell me I have an Asian Heart and Soul inside a Mexican body! LOL! I love Congee, Phó Dac Biet, Mi Hoanh Thanh, Ommu Rice, Kimchi Chigae, Soon Saw, Laap, anything Spam! I can keep going! Thank you for this recipe it will help me get through busy days at salon! I adore cooking to the point that my two favorite pots are my Dutch oven and stove top pressure cooker. I always look forward to your Instagram posts and attempt to harness and channel your authentic flavors. Thank you for sharing what you love to do with all of us! Also, I truly enjoy the aesthetic of your food photography. I grew up with a British mother an Chines father, but we never ate much Asian Food… However, after studying Mandarin at Uni I became inspired to try my hand at Chinese cooking. I lived in Hangzhou for a while, with a family who had a 5 year old girl. Her great aunt would help with the cooking and my favourite dish she would cook for us was 栗子焖鸡 (Chestnut Braised Chicked). I’ve been developing my own recipe trying the copy her method. work in progress at the moment, but my mum and dad back in the are are massive fans already! I’d love to learn more recipes and the book looks fatntastic, i’ve Been following your blog and the two red bowls book for a while now! Apple tarts are my favorite especially while growing up in Chinatown. Hi! As a Chinese American, I love steamed pork and Hong Kong style chow mein. Huge fan of mapo tofu myself. First time I tried making it I added way too much Sichuan pepper. My mouth was numb for an entire day! I’m very surprised at the use of Spam and I look forward to trying it out more, seeing that there are new and interesting ways to incorporate it in recipes. I am willing to try it. One of my all time favorites is definitely the Szechuan Beef Stir fry though (yum!) Love the recipes,emails and all the information I have learned from you. My all time favourite Chinese dish is dumplings. Hand made dumplings reminds me of memorable moments shared with family members. When it’s Chinese new year, grandparents and parents sat around the table making dumplings together while cousins and I play with the flour dough and make a mess…. To me, dumplings are cute because they are round and chubby, they are also steamy, juicy and filled with love and joy. Favorotes include dumplings, scallion pancake, and anything with fried tofu! I love to cook and eat kimchi jigae (kimchi stew) with spam or pork belly! Love a good beef and broccoli stir fry. I’ve made some lemongrass meat balls for a banh mi sandwich that was pretty tasty..
For me there is a local place that does a superb Sichuan Beef, but I will always be in love with the Baozi that is available on the streets of Chengdu! I Love Chinese hot pot and make a version at home for my family. Everyone else loves the variety of the foods too. I hope I win the cookbook. Thanks. Tbh this is one of my favorite Asian recipies, after this though, it’s gotta be miso soup. Easy to make, but can have incredibly complex flavors. Set wok on high heat, count to 20, swirl in oil, add cabbage and celery. Stir till fragrant and bright green. Remove wok from heat. Add remaining ingredients. Toss well and fill eggroll wrappers. Set on wax paper in refrigerator for 1 hour to rest. Deep fry. Now, honestly, I have not made this quantity for many, many, years. I will now make 80 to 100 per batch. My family and friends fight over them. Love spam musubi! I make it every few months. My favorite chinese food is all the dim sum I can eat on one sitting! My favourite asian dishes?! I’ve got tons! Green onion pancake, beef noodles, dumplings, ginger beef, tomato egg stir fry, chili wontons…anything asian! The house hold favorite would have to be Thai sticky rice. Everyone loves it. 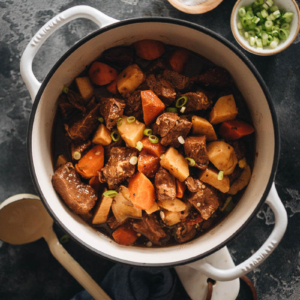 My favorite Asian dishes are braised short ribs with various Asian inspired ingredients. But mostly where I tuck star anise in between the ribs. I also enjoy various versions of Taiwanese Minced Pork. Having grown up with Spam in Minnesota I am excited to try this Spam Musubi. Steamed pork buns are hands down my favorite Chinese food. That along with some good garlic eggplant could easily be a meal for me. My favorite dish is Mongolian beef. I tried your recipe and it turned out so well. I will make it again for Chinese New Year. Looks delicious. Char Siu bao, Roasted Duck, and Anytime type of Mei Fun! Spam is truly comfort food. I remember having it when I was a kid. Spam musubi is so good. My kids google it up. Thank you! This looks SO GOOD! Asian food is my favorite! I like making California rolls and my own kimchi at home. I like Singapore Noodles. I am not fond of Spam, but this recipe makes it look good. Char Siu! and Beef Chow Foon. These look great, I’d never heard of this snack until I moved to the west coast and enjoyed a lake day with a Hawaiian co-worker. This Cubana enjoyed spam musubi so much, my friend difted me a spam musubi mold for Christmas that year. I love making/trying new foods (and reading new books) as it’s a great way for me to “travel” on a budget 😉. Steamed soup dumplings are a favorite around here! I actually really love spam musubi. Also, pho and five spice beef and daikon radish stew. Asian cooking is the best! Although Spam is frowned upon in the USA, I must try this recipe. Char sui, egg and tomato, dumplings! My most favorite recipe that I make is your beef noodles that is made with hamburger & 2 saimin packets. Its delicious, fast & easy to make, & my 3 boys love it! They devour it in seconds lol. I’m actually making it again today. I always get so excited when I see your posts. I’ve made several of your recipes & never disappointed. Thank you Maggie for making cooking fun again & I love being able to try new things. 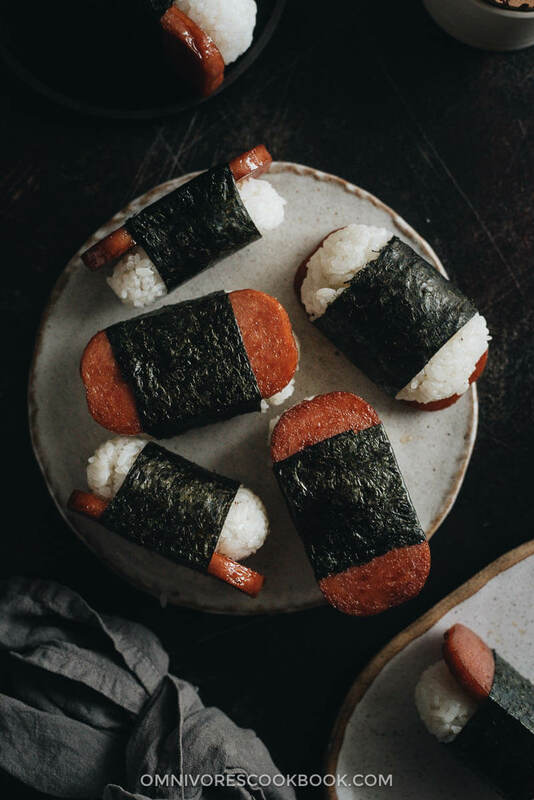 I grew up in Hawaii so these spam musubis were everywhere. I just bought the stuff to make it & can’t try your version of it! Shrimp Summer rolls with peanut sauce is my favorite! I’ve also rolled Spam too. Can Hawaiian food be included? I love such a broad variety of foods and cultures. I first had Spam musubi from a 7-11 in Honolulu (I’m sure it wasn’t as good as your recipe, which I’m gonna try this weekend). There’s blood sausage and malasadas from the Portugese (even in McDonald’s– -ramen (saimin) too) and shu mai, sushi and poke, bahn mi, manapua (bao), laulau, kalua pork, literally Pan-Asian! There’s even macaroni salad and passionfruit (lilikoi) cream pie inspired by the US. It’s just a great and beautiful place to eat. Hmmm, you wish me to provide you with my favourite Chinese dishes. The list is just too long but if pressed, I would have to say that two at the top of my list are Shui Zhu Yu – because it has my favourite spice in it Szechuan peppers. My next favourite dish is a double cooked pork belly dish that I do not know the name of but the meat is so delicate and full of lovely flavourful fat. My mouth waters just to think of it. I love trying different Chinese recipes. I don’t really have a favorite recipe although I am partial to pineapple chicken. Simple ingredients that are easy to sourcé works best for me as I only have very small asian stores near by. I love your ideas and the recipes as they have been very good. Just bought a hot pot at Christmas time and have enjoyed it so far. What a time saver! people devised nourishing and satisfying soups of whatever was available. What a legacy! 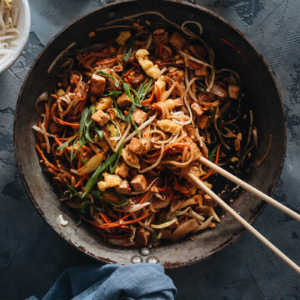 Give me Cashew Chicken… My husband Vegetable Lo Mein… and the dessert is Sesame Tofu. WISH I had a good recipe for each of these! The Sesame Tofu comes in a dark brown sauce with Broccoli Florets, steamed and arranged around the sesame tofu. Delicious! My favorite Chinese dish more Japanese cause its sushi is a light tempura battered smoked salmon, with cream cheese, cucumber, avocado, and scallions on the inside rolled up maki style with salmon and tuna on top with jalapeno minced on the tuna and lemon zest on the salmon! Then top with ponzu and kimchee based red sauce we make! I kinda want to try and make a spam sushi roll at work now!! Your recipes are amazing! Homemade dumplings and any kind of bao! It’s our family tradition to make homemade dumplings, onion pancakes, and another dish or two on Christmas Eve. This year we made your recipe for black pepper chicken and it was a huge hit! Just went to the Asian grocery today and picked up the ingredients your red bean soup. Can’t wait! I’m still trying to perfect my dry fried green beans to what we had in Datong last year. It’s our go to recipe when family is around My boys love the sweet and sour recipe on your site and the cheesy shrimp spring rolls. But we can all agree on bao! Spam fried rice is a big favorite in our household! We usually add scrambled eggs and chopped pickled mustard greens, and then whatever other leftovers we may have lying around. I grew up eating the luncheon meat you bought in the supermarkets in Hong Kong (the one with the white pig on the container), so I’ve tried to convert my American friends into spam-lovers as well! I remember eating Spam as a child for lunch in sandwiches but have not eaten Spam since then. Time to experiment! There are so many things – steamed baos, homemade dumpling (the social aspect of making them together as a family is in itself very enjoyable), drunken duck, char siew…. just to name a few! This looks delicious and comforting. My favorite asian dishes are noodle soups of all kinds. Some of my favorite recipes are Hong shui gai kew (hard to find), seafood congee, kimchi pancakes, salmon sushi any type, and red bean onigiri. Fried rice is one of my favorite Chinese recipes. I lived in Taiwan for a while and love making jyaudz. I have not had the privilege of traveling to any Asian country but I have a love for all Asian food. Fridays I have eggrolls, Thai red curry, and Hunan beef. The last city I lived in I got this house Thai dish that they do not make anywhere else. It is the Noi special. Kind of like pad thai but without the peanut taste. Really though, I will take it all. I love cooking and experimenting. I try to recreate some of the dishes I come across and love. My niece, who is graduating from college this May, is the biggest musubi fan! I”m sharing this recipe with her and if I win, she can borrow this cookbook! We love to prepare Asian dishes like chicken stir fry with veggies and fried rice. I also experiment with lots of dessert recipes like black sesame pudding and almond jello. Thanks for the opportunity to win this cookbook. It always takes me back to growing up in Hawaii. I am a junkie for SPAM musubi. I can’t wait to try this recipe. It looks comprehensive and straightforward . I’m looking forward to digging around on the site I hope you also have creative ideas for poke bowls. My favorite Chinese dishes are probably beef chow foon and soy sauce chicken. I love your site! Thank you for the giveaway. Hi! Love your blog, but I’m really ignorant about Chinese food… I really love eggplants in the style of Sichuan! I grew up with Korean food, so my favourites are mandu (dumpling) soup and pajeon (green onion pancakes). My favorite Asian/Chinese food is soup noodles. We loved your Cantonese roast chicken recipe. I haven’t eaten Spam since I was a kid which was over 50 yrs ago, but as one of my many favorite meals that I had cook from your recipes is Cabbage and Glass noodles stir fry, the other is Thai Sweet Chill Chicken. My favourite recipes are Cantonese crispy pork belly and ground pork with duck eggs! I *love* Chinese soups. I had a friend teach me to make spicy fish soup once, and it was so simple and delicious. Perfect for when you’re feeling under the weather. I also love dumplings, stir fry vegetables, and hot pot! That spam is so perfectly caramelized! Some of my favorite Asian dishes are egg & tomato stirfry, spicy fresh bamboo shoots with pork, and any type of dumplings! My favorite meal that reminds me of home is “kimchi jigae” kimchi stew. My mom used to make spam fried rice. Whenever we have leftover cold rice, she would make it. I still make this for my kids. So comforting and reminds me of my mother. Just made some spam musubi last night! Some of my favorite dishes are shengjianbao, jianbing, briased tofu, pork belly rice, and tangyuan. Thanks for sharing this simple spam musubi recipe! I’m happy to have stumbled upon your website and can’t wait to try your recipes – I like the idea of cooking with only a few ingredients to make the flavors stand out! My favorite Asian dishes are any that involve noodles soups!! And there’s plenty to choose from – beef noodle soup (Pho) from Vietnamese cuisine and the Chinese beef noodle soup are my favorites! I wasn’t sure what musubi was, but after seeing this recipe I would love to try it! I’m a big fan of hot pot and kimbap, so it’s nice to see some different ways to use spam in Asian dishes! I live in China now, so I’m thankful for all the exposure I can get to different cuisines as I travel around China and Asia at large. I’ve been trying to hunt down a good recipe for lions head meatballs for ages — haven’t found one yet that lives up to my grandmothers but hoping A Common Table’s might be the one!!! My favorite asian dish is xi’an liang pi, or cold bean noodles. It’s a cold noodle dish from a northwe part of China where the noodles are made from mung beans, sliced, mixed with tofu, bean sprouts, a nutty dressing, and a healthy dose of hot chilli oil with Sichuan peppercorn! Tasty and numbingly good! I love niu rou mian or Taiwanese braised pork over rice. Would never say no to either dish. I love niu rou mian or Taiwanese braised pork over rice! Both are my favorite comfort foods. Over the years I’ve explored cooking many different cuisines, such as Indian, Mexican, Middle Eastern in large part my wife is a vegetarian and I am not. I try to focus my cooking around a theme, or a region, to incorporate vegetarian and non-vegetarian dishes. I find Chinese and Asian cooking was the hardest to figure out until I discovered this wonderful website. I absolutely love the recipes here, they’re easy to understand and to follow, and it’s such fun to explore the “real deal” recipes. It’s gotten to the point where the family is asking for Asian food nights more often. My favorite are homemade dumplings! Spring Rolls! Anything with noodles! DUMPLINGS are my all time favorite. Stuff anything into a dumpling or wonton wrapper and I could eat it all day long. I love a good Cantonese-style steamed fish. It sounds so easy but 8/10 times it’s not done perfectly! I love Asian food! I’m Chinese myself with family from Shanghai and Hunan, but funnily enough my favorite style of Chinese is Cantonese. But I always have a special place in my heart for Shanghai wontons and xiao long bao. My favorite Japanese food is udon with beef. My favorite Korean dish is kimchi pork sundubu. My favorite Malaysian dish is roti canai. I’m also obsessed with spam musubi, but I never encountered spam until I had it in Korean and Hawaiian food. Spam musubis remind me of my wedding in Hawaii. Looks really tasty! I’m definitely going to try it out, great history of differences in SPAM history. I love crab ragooons and mochi. I also love that Asian food has soo many ways of preparing fish compared to the Midwest! So amazing! I tried this last night and it was loved by everyone! I love to make beef noodles as a Chinese dish! Would love to see more recipes! My favorite dishes will always be my grandmother’s hongshaurou and my mother’s egg tomato soup! Ultimate comfort! I have been really enjoying your vegetarian Chinese recipes, particularly General Tso tofu. LOVE spam musubi especially after my time spent living in Hawaii. I’m also always up for ramen and am trying to perfect some recipes. I would love to explore more Korean dishes too ! This cookbook sounds SO perfect! Nothing like some egg drop soup on a chilly day to be nice and comforting for me. I love looking through your blog, the pics make help inspire ideas for dinner! My favorite Asian dishes are 干炒牛河 aka Gon Chow Ngo Ho and Cha Siu Bao! Spicy wontons are also a guilty pleasure. I came to your website looking for a good cashew chicken recipe. It was terrific! Gee, I’ve loved Chinese food for as long as I can remember. About 20 years ago, my daughters discovered anime and manga and got involved in finding out more about Japanese culture, too. We have a huge Japanese market not really far from our house – they also have a bookstore and great food court, so my girls and I would go there weekly for quite a few years (we now don’t go as often, but go about 1-2 times a month). I started learning some Japanese dishes, including Odon, Sukiyaki, Okonomiyaki, and one of my favorite things to make – taiyaki (I have the special pan for making the fish-shaped, sweet red bean paste pastries. When I think of Asian food, I think of food that my grandma makes. She immigrated from southern China to California almost 40 years ago, and growing up across the street from her made me feel so lucky. She was always bringing over traditional and fusion dishes and baked goods. Now that I’m in college and away from home, I miss her cooking a lot. I especially love her curry egg rolls (your typical fried egg rolls but with curry powder for a savory boost! ), crystal dumplings, and sticky rice. I love Chinese dumplings. So most recipes that have it I will eat. I also love Sweet and Sour. I love Japanese ramen and Sushi. I love dishes with Curry. I can go on and on! Your recipes has helped me alot cook my favorite dishes when I moved to the US. Especialky since I saw that alot of the ingredients were not readily available. 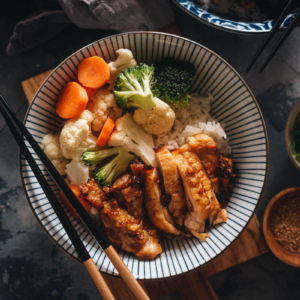 Asian food is my favorite – so hard to choose just one thing! I love Chinese soups, sea cucumber with shrimp, abalone. Oh the list goes on! My current favorite dish is congee. I’ve been playing around with different types of rice, levels of water, and most recently asked my Ma Ma how she made her porridge, and I got some new techniques to make the rice extra fluffy and silky! Love army stew!! But spam musubis are also a fave!! I started following your blog after my first trip to China in September. Had a hankering for real Chinese food here in TX—Favorite dish is your real deal Szechuan Beef stir fry! Also would never turn down Pad Thai. After my first visit to China I had a hankering for real Chinese food when I got back to TX. My favorite dish is your Szechuan beef stir fry! Lanzhou beef noodle soup is my favourite dish! Shrimp and pork wonton noodle soup! So comforting! I’m stating to cook more this year, so I’m starting the year on a good foot! My favorite dishes to make is Baked Salmon and Oven Baked Mussels! I’m excited to try spam musubi! I love making various types of Ramen, but my favorite dish is the spicy stir fried lamb dish that I make…it’s my go-to for Asian cuisine! I have too many favourites to list but Sichuan Boiling Fish: Shui Zhu Yu is a top contender! Some of my favorite asian dishes are yum woon sen, kalbi ribs, and papaya salad. Looks amazing. I recently started to cook and I was truly inspired by your page! I love your videos too and I would like to recreate everything you made so far (in fact I printed some recipes and want to make them soon). My favorite Asian Dishes are for example sushi, nasi goreng (I think this one is my favorite because I have such good memories), some dumplings. I am originally from Europe but I love Asian culture. I can eat steamed bbq pork buns for every single meal. But this spam recipe looks bomb! I also can’t refuse a good Tom yum soup. My personal favorites in the Asian Recipe Repertoire are a home Korean BBQ spread, Hot Pot, and my husband’s personal favorite, gyudon! The flavors are always a winner. Spam Musubi is a big easy rainy day favorite. One of my favorite dishes is Pho, its so aromatic. I love it. I made it last week, at least as close as I could get to it. Having all the little add ons was nice, like choose your own meal.